You are developing an Azure solution that individuals and small businesses will use to prepare and file tax-related documents. The solution must provide a way for customers to enter personal and demographic information. Customers must be able to upload income documents and related documents to the solution. The solution must provide reports and summary documents for customers in PDF format. The solution must support two operational modes: On-Peak and Off-Peak. On-Peak is defined as the first quarter of a year. Off-Peak is defined as the other three quarters of a year. Customers must be able to access the solution by using desktop computers, laptop computers, mobile devices, and tablets. The solution must be available at all times. When the solution transitions between Off-Peak mode and On-Peak mode, solution availability must not be affected. Disaster recovery must be established for the customers’ stored data. A company is developing a website that supports mortgage loan processing. You use the Azure management portal to create a website. You initially configure the website to use the Basic hosting plan. You register a custom domain for the website with a valid registrar. Customers complete mortgage applications and upload supporting documents to the website. A custom executable named FileProcessor.exe processes all of the information received. An on-premises server that runs Windows Server hosts the executable. You create a virtual hard disk (VHD) image of the on-premises server. You plan to use this VHD to replace the on-premises server with a new virtual machine (VM) that is hosted in Azure. – The website must provide a secure mortgage application process for the customer. – Business users must validate new versions of the website before you publish them to the production site. You must be able to revert to the previous version easily when issues arise. – The website must remain available to users while new features and bug fixes are deployed. – Network traffic must be monitored on all ports that the website uses. You manage two cloud services named Service1 and Service2. The development team updates the code for each application and notifies you that the services are packaged and ready for deployment. 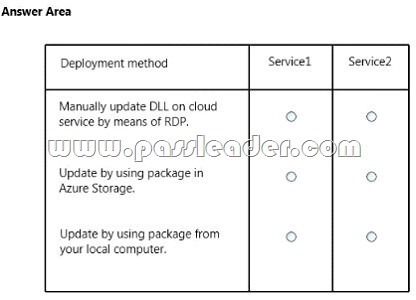 Each cloud service has specific requirements for deployment according to the following table. You are the administrator for three Azure subscriptions named Dev, Test, and Prod. Your Azure Power Shell profile is configured with the Dev subscription as the default. You need to create a new virtual machine in the Test subscription by using the least administrative effort. 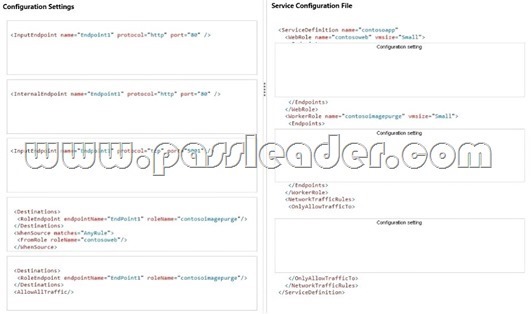 Which Power Shell command should you use?